Vegetated habitats in estuaries may provide a structural refuge and food supply in the same place, but benefits are also derived where a productive food source and suitable habitat are adjacent to each other. Quantifying these relationships is fundamental to understanding the structural and functional characteristics of estuarine ecosystems and for informing management actions. Effective juvenile habitat (habitat that contributes greater-than-average numbers of recruits to the adult population), recruitment patterns and trophic relationships were studied for Eastern King Prawn (Penaeus plebejus) in the lower Clarence River estuary, New South Wales, between 2014 and 2016. Effective juvenile habitat was identified in both the north arm and main river channel of the estuary, and these areas also supported a higher abundance of juvenile prawns. There was minimal recruitment to the southern channels of the estuary, possibly due to reduced connectivity with the incoming tide arising from a rock wall. 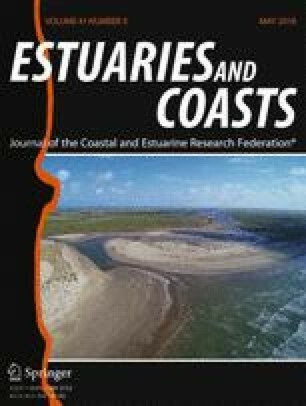 Trophic relationships in parts of the lower estuary were evaluated using stable isotopes, and saltmarsh grass (Sporobolus virginicus) was the dominant primary producer supporting juvenile Eastern King Prawn productivity across the area. Mangroves were of minimal importance, and seagrass cover was minimal in the area studied. The patterns observed indicate that nursery function of different areas within the lower estuary is a product of connectivity, recruitment and nutrition derived from primary productivity of vascular plants. Habitats within the lower Clarence River estuary have seen substantial degradation over decadal time scales, and the implications of our findings for targeting future habitat repair are discussed. We thank B. Fry, E. Mitchell, I. Thiebaud, S. Walsh, H. Whitney, T. Ryan, A. Fowler, A. Russell, V. Raoult, D. Coulthard and J. McLeod for assistance collecting samples throughout this project and K. Russel and C. Copeland for guidance during the execution of the project. This project was supported by the Fisheries Research and Development Corporation on behalf of the Australian Government (2013/006; project partners Origin Energy, Newcastle Ports Corporation, Hunter Water and Local Land Services). Funding bodies and project partners had no role in the design, data collection, analysis or interpretation of data. Prawn sampling was carried out under permit P01/0059(A)-2.0 and Animal Research Authority NSW DPI 13/08. Sheaves, M. 2017. How many fish use mangroves? The 75% rule an ill-defined and poorly validated concept. Fish and Fisheries. https://doi.org/10.1111/faf.12213. Taylor, M.D. 2016. Identifying and understanding nursery habitats for exploited penaeid shrimp in NSW estuaries. In 25th Annual NSW Coastal Conference, 9–11th November, 2016, 1–8. Coffs Harbour. http://www.coastalconference.com/2016/papers2016/Matt%20Taylor.pdf.